Be aware when metal detecting in Arizona, or treasure hunting, you need to understand the laws that govern the hobby. You can learn how to prepare yourself by paying attention to this page. I have a lot of information pertaining to the laws. Where most people get into to trouble is when they venture onto state or federal lands to metal detect. In the past a few individuals have knowingly gone onto State lands to dig, and were caught. What happens is that a few individuals put a black eye on the hobby for the rest of us. On this page are stories of what has happened to others who do not follow the law. The Arizona laws follow the laws of ARPA. ARPA (Archaeological Resources Preservation Act. B. RULES IMPLEMENTING A.R.S. ' 15-1631 AND 41-841, ET SEQ. membership in a common cultural group. that seeks to obtain a permit. burial grounds, and inscriptions made by human agency. 4. "Archaeological specimen" is defined in A.R.S. '41-841. disturbing the ground at or around that location. official designee of the Director. movement of earn or stone. including testing for the purpose of site evaluation. collection of archaeological or paleontological specimens. fossilized evidence of a plant or animal, such as a footprint. the State as required by A.R.S. '41-841. which a permit is issued. directing all phases of a project. historical collections and records for the benefit of the public. causing any disturbance of the ground. who seek to undertake those activities set forth in A.R.S. '41-841. secured from the Director of the Arizona State Museum. I cannot be responsible for any outdated laws from the time of this posting. Metal detecting in Arizona can be a lot of fun. However, you need to be careful, and understand the laws. My eBooks Special Bundle Package! 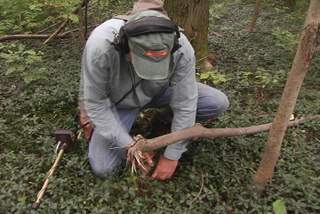 Are You Looking For A Metal Detector Or Accessories? Did you know there are ghost towns in the East? Metal detecting in Arizona ghost towns is different than searching in the old eastern towns.